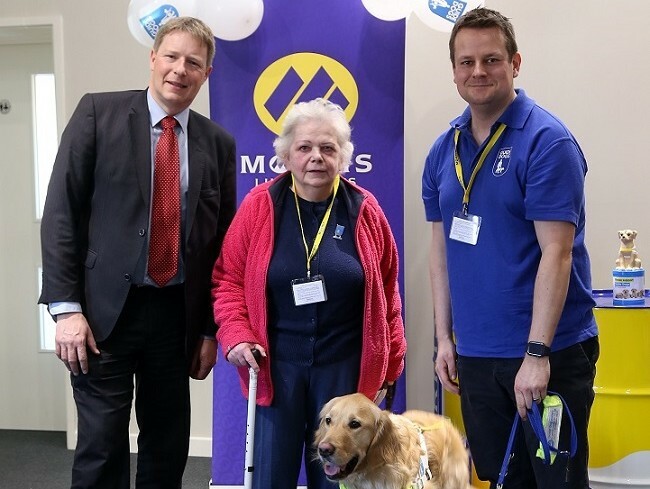 The company, which is celebrating its 150th anniversary, has chosen Guide Dogs For The Blind as its charity for 2019. It has signed up for one of the charity’s ‘Learn’ packages, which involves adopting and naming a guide dog puppy, and funding its two-year programme of training and development. And the name which staff have chosen for their adopted guide dog? Morris, of course! A busy programme of fundraising events is already under way, with at least one activity planned by the Morris Lubricants team every month. Already, the company has held a ‘win a day off work’ raffle, where employees paid £2 a ticket to enter. This raised £375 - which was a great start to the campaign. The company is also working with a range of businesses around Shrewsbury who are generously donating raffle prizes. Representatives from Guide Dogs For The Blind visited the Morris Lubricants offices at Castle Foregate to give a talk to staff, and brought along a guide dog puppy in training, called Oscar. They explained the importance of fundraising to the work of the charity, and organised activities which gave employees the chance to experience what it is like to be visually impaired. Guide dog owner Rosemary, who was paired with Barney three years ago, also gave a talk about how a guide dog had transformed her life. Andrew Goddard said: “There are almost two million people in the UK who are living with sight loss, which has a significant impact on their daily lives. Many of these people rarely leave their homes alone, which means they can sometimes lead lonely, isolated lives.